CCI is a self-run, self-help network of people who use co-counselling in order to make the most out of life. It’s been going since 1974. CCI stands for Co-Counselling International, and is active in many countries. CCI has no leaders – everyone is equal (peers), so it’s non-hierarchical. CCI exists in many countries, especially in Europe, North America and Australasia. After completing the course in co-counselling you will have access to the CCI worldwide network, and if you join a local CCI group you will receive contact details of other co-counsellors. You may work in pairs or small groups with others using the techniques you learned on the course. I’ll help you contact other co-counsellors who are closest to you. You may attend the events described below. And, after doing the course, you may simply decide to take away with you the benefits you got from doing the initial course, and decide not to join the network. 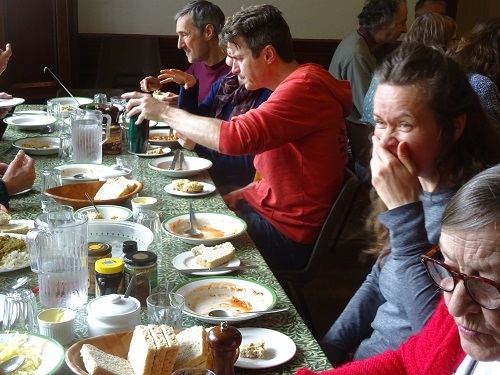 If you decide to attend workshops and/or residentials you can experience ways of working and playing together free from some of the restrictive interactions of the everyday world. The environment on these weeks or week-ends can be truly liberating. Workshops get offered on a wide variety of themes, and you can learn to run workshops yourself if you wish. These are either a week-end (including the Monday if it’s a Bank Holiday) or else a whole week. A small group (say 3-4 people) will book a venue and do the necessary publicity. The organising group will welcome people to the event, and host the initial opening circle which gets the event started. 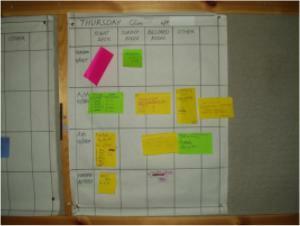 They will also devise a blank timetable structure, which usually has spaces for morning and afternoon workshops. Evening activities are generally more social, relaxation or fun based (singing, games, cabaret, dancing, bonfires, music, massage etc, or just chatting). Cost varies from event to event, but most are low to medium cost. Many offer cheaper prices if you camp. 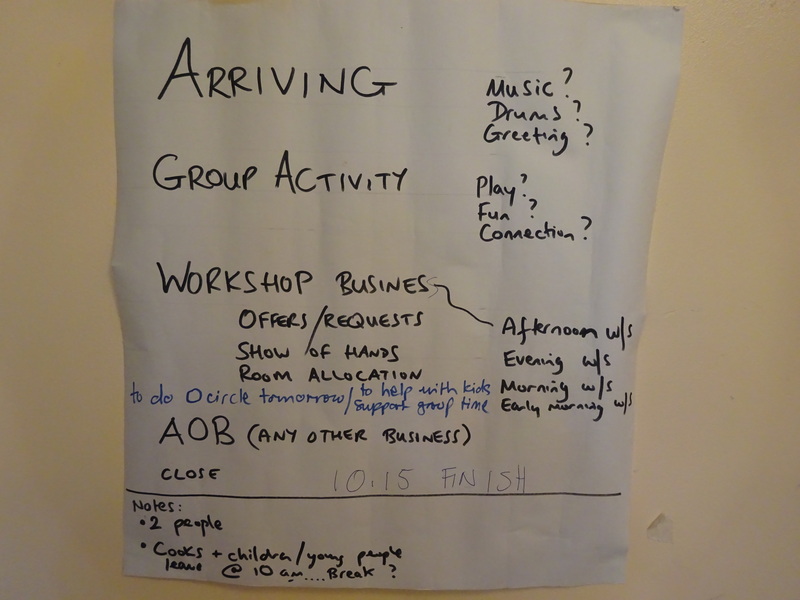 The blank workshop spaces are then filled, as the event progresses, by workshops that people either want or offer. These workshops are either peer-led or else facilitated by the person who offers. They are either strictly co-counselling based, or non-co-counselling, or else a mixture of the two. The person who suggested the workshop makes it clear what is on offer. The workshops often have a theme (e.g. loss, saying goodbye, choosing, voice-work, body-work, sound and voice, dramatherapy, Five Rhythms, – the list is almost endless). You attend the workshops that appeal to you. 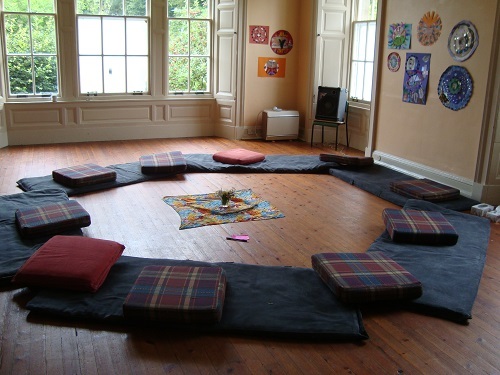 If you go to a co-counselling residential you will experience people each morning in the Opening Circle offering ‘workshops’. You might wonder what that means. 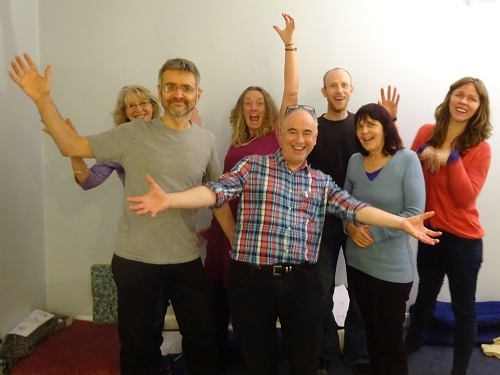 There is a kind of classic format, which is not written down anywhere in any rulebook, but here is what happens in a ‘straight down the line’ co-counselling workshop’…. Let’s suppose you are interested in working on a certain issue or theme: the theme could be, for example, death, eccentricity, ageing, food and eating, intimacy, friends, my home, schooldays etc. You can offer this workshop yourself. People who sign up for your workshop meet for an agreed length of time, typically a couple of hours. 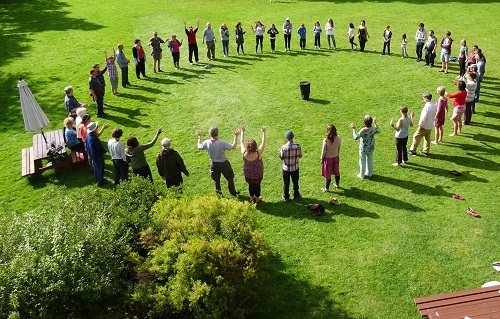 First, have an opening circle, e.g. a round of names and a quick check-in: ‘how I am feeling right now’. Next, a sharing round – what has drawn you to come to this workshop. Next, have sessions, usually two-way, in pairs. This could equally be in a group, with equal time. This latter is something I sometimes prefer because it keeps the energy in the group. Next, have a plenary sharing round, then, closing circle. That’s it! 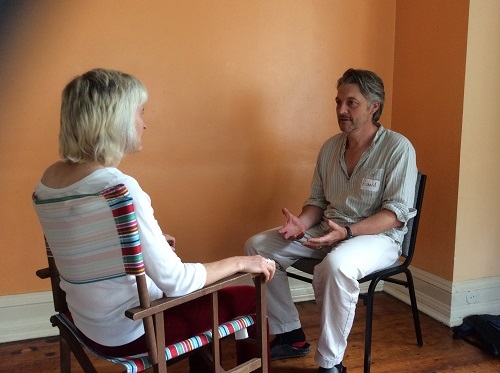 At our events it’s possible to attend or offer workshops that really challenge you to face things you find difficult. Some of these are straight ‘co-counselling’ workshops that have a strong element of co-counselling, and others are ‘non-co-counselling workshops’. In such a format the ground rules of equal time may not apply, and there may be an interpersonal element. These workshops have elements built into them that are aimed to help create a supportive environment. We usually form support groups (usually 4-7 people) early on at the event: these meet for an hour each day e.g. after tea-time. At the beginning of a residential attention is often given to helping – not just ”new people” – settle in. This may be, for example, some group-building exercise, or a session-based workshop on ”being here”. The point of all this is to help create an environment where it feels safe enough to take the risks involved in personal growth. Ultimately however, no situation is entirely free from risk or challenge. Also, if you need some support at a specific time, you may need to take the responsibility for asking for it. Gatherings are usually non-residential and are organised on a local basis. They may be for a couple of hours on a weekday evening, or on a Saturday or Sunday for two or more hours. We have an opening circle, group and/or pair work, and maybe a part that is facilitated by someone on a particular theme. We also may eat together.